The new research provides an explanation for the "missing link", say French researchers. He told BBC News: "We could find evidence of troubles at the individual scale in the field but these troubles were compensated for by the colonies. "The population inside the hive was able to compensate for the increased loss of worker honeybees by increasing brood production." 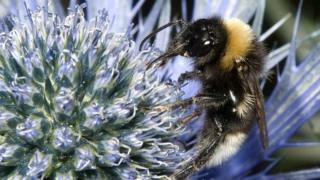 Dr Scott Hayward of the University of Birmingham, who was not connected with the study, said the work "re-ignites arguments to ban neonics", and similar studies are now needed on other pollinator species. A spokesman added: "The Government makes decisions on pesticides based on the recommendations of senior scientists and independent experts who have looked at the best available scientific evidence. "The Commission has now begun a review of the science relating to neonicotinoids and bees, and the UK will contribute fully to this review."